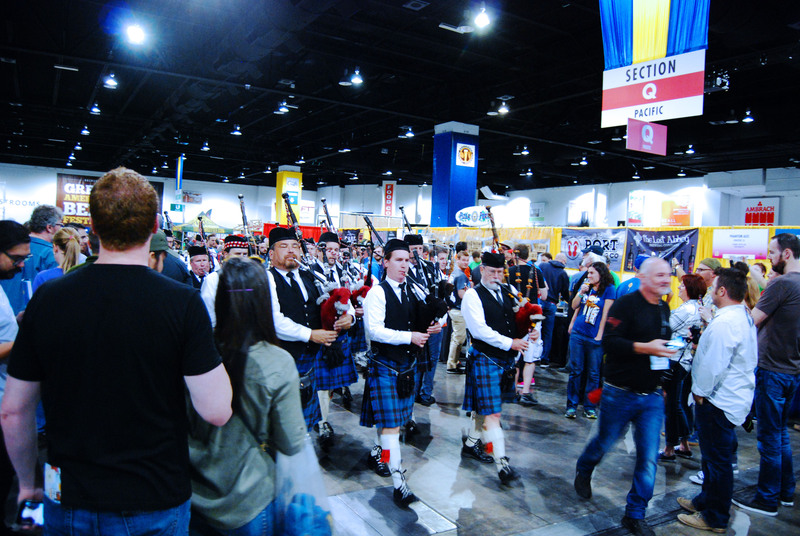 Each year I’ve visited the Great American Beer Festival in Denver, I try to come back with some sort of story for my recap that’s more than just “beer good, this one lemony” for 2,000 words. But as it slips further into the past and my life gets busier each day, I completely lose any storyline and just dip back into my memory for a bit of daydreaming from time-to-time. But I still need something to tie the piece together. I can hardly capture the sincere, creative approach that MC brings at Worth A Thousand Beers, nor do I buy into the clickbaiting of others’ blog posts. Perhaps I can let the lines tell the story? 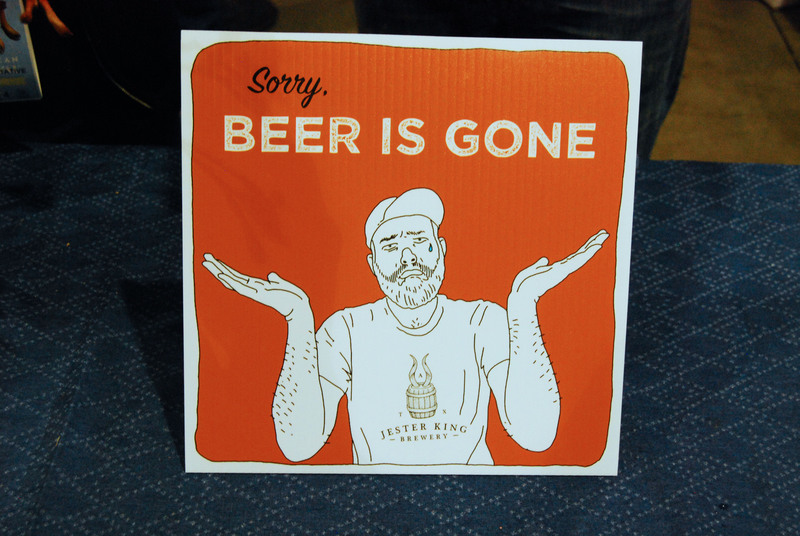 Nevermind – “beer good” will work again this year. Due to other obligations, I only attended Friday night and Saturday afternoon’s sessions of the festival, so I came out with a slightly shorter list of great beers for the recap. Typically, the beers that make my list I revisit more than once or twice – but I didn’t quite have the luxury this year. But I made the most of our time there, cramming a hundred or so unique beer samples into just three days in Denver. Here’s what I daydream about. Don’t hate the Haterade, hate the game. J. Wakefield Brewing’s line got a bit longer, but they’re still not quite drawing the Rare Barrel crowds – though they should. The fruited Berliners coming from this Florida brewery are unlike any I’ve ever tasted. Haterade tastes exactly like fruit punch Gatorade mixed with a melted red popsicle that finishes tart and dry with no residual sweetness whatsoever. 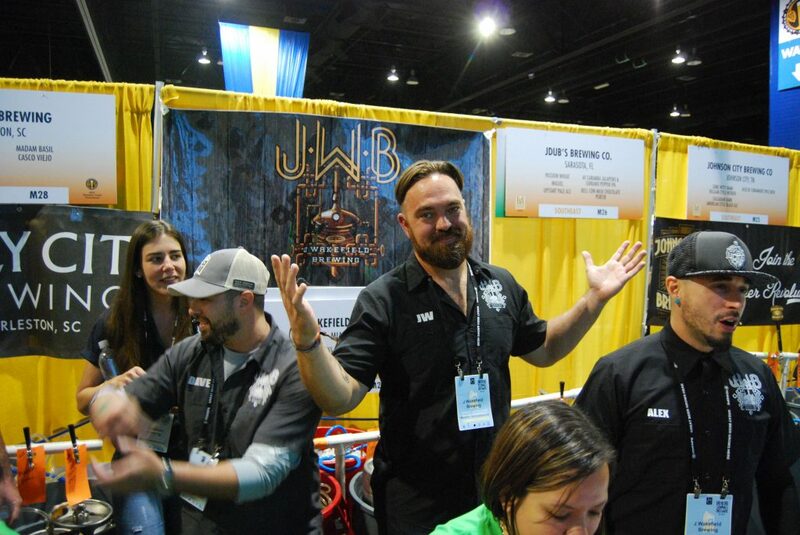 Miami Madness was my favorite beer at last year’s GABF and it held onto that title this year. It uses mango, guava, and passionfruit which are all mixed into a tart cocktail that is also reminiscent of a sparkling pineapple grapefruit soda that again ends sublimely dry. The Stay Puft marshmallow smoked porter was a nice change of pace tasting a bit like a campfire s’more. GABF attendees saw this. A lot. 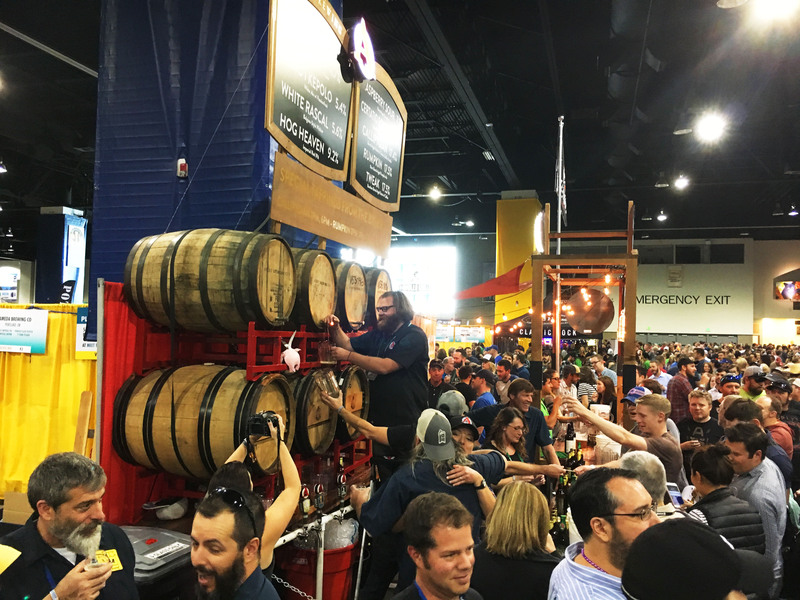 Jester King couldn’t possibly bring enough bottles to meet the rabid demand of folks happy to see them return to GABF, so each session they ran out early. It had been a long time coming for me to try Atrial Rubicite, their much-loved barrel-fermented raspberry wild ale, so I made this my first stop. It didn’t disappoint – the beer is both complex with funky and earthy wild yeasts yet light and airy in a way that is refreshing compared to the acid bath of other sours. The raspberry is similarly light with no overdone syrup or jam notes that would distract from its farmhouse base and dry finish. Their Montmorency vs. Balaton is another stunning and delicate wild ale that only became a touch more acidic than Atrial. But again the cherry flavor is a great complement to the base rather than a burden on it. The somewhat-unnamed 2016 Spon 1 is akin to a Gueuze Light – it has lemon, orange zest, wet grass, and a hint of toasted oak. The sourness is like a quick citric acidity, and the body is light before ending even and dry. 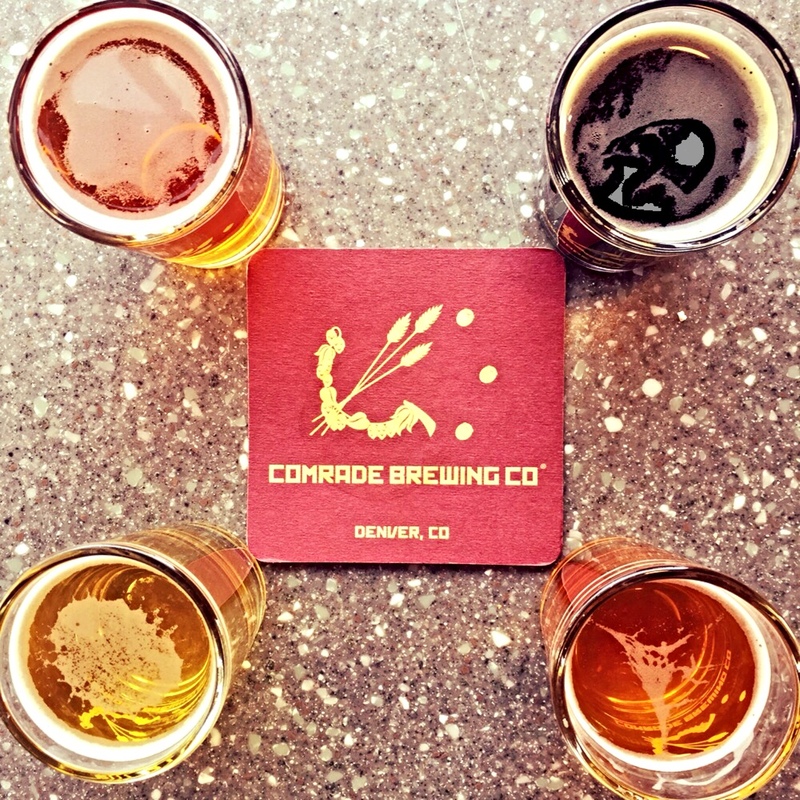 The beers stood out most due to their delicate restraint – all were flavorful but pulled back before letting any one element take dominance. 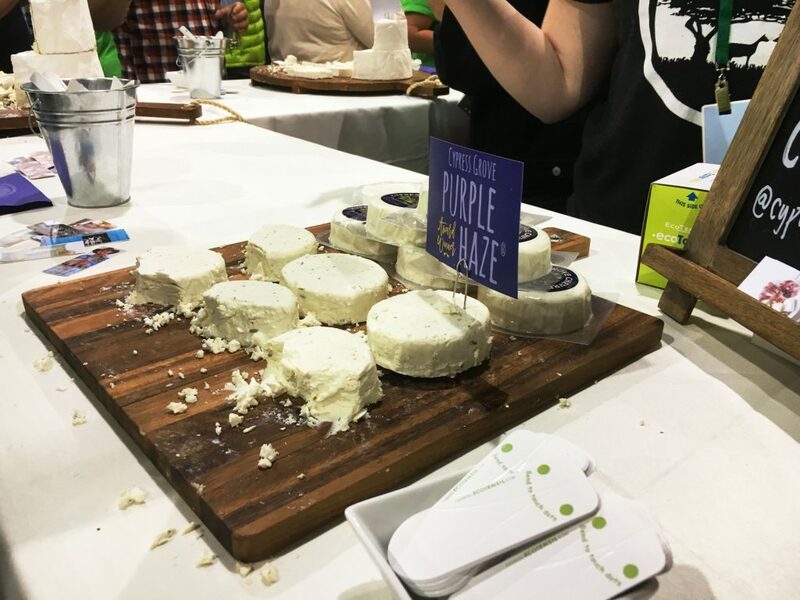 My favorite booth of the fest belonged to Cypress Grove, the American masters of goat cheese, as far as I’m concerned. (I am a fancy cheese novice, despite being a dedicated cheese lover.) These cheeses go for a pretty penny at the local market-style grocery stores, so I don’t often have them in my budget for beer and cheese pairings. (Thank god for Trader Joe’s on the cheap cheese front!) So when I have a chance to gorge myself on Humboldt Fog, I take it. The line was never excessive here, compared to the other free food and snack areas. The line takes you on a journey from one ridiculous wheel of goaty goodness to another, each gooey morsel tooth-raked off of your fancy cardboard tasting card. Purple Haze is sweet and nutty, while the Truffle Tremor is umami and salty. Humboldt Fog is like a goat-cheese brie with some grassy moldiness and an excellent sharpness. The Midnight Moon was a harder cheese, toothpicked again and again by Craig. The flavor is closer to an aged white cheddar mixed with an aged parmesan. We visited this booth no less than 10 times – no joke – yet I regret not going more often. 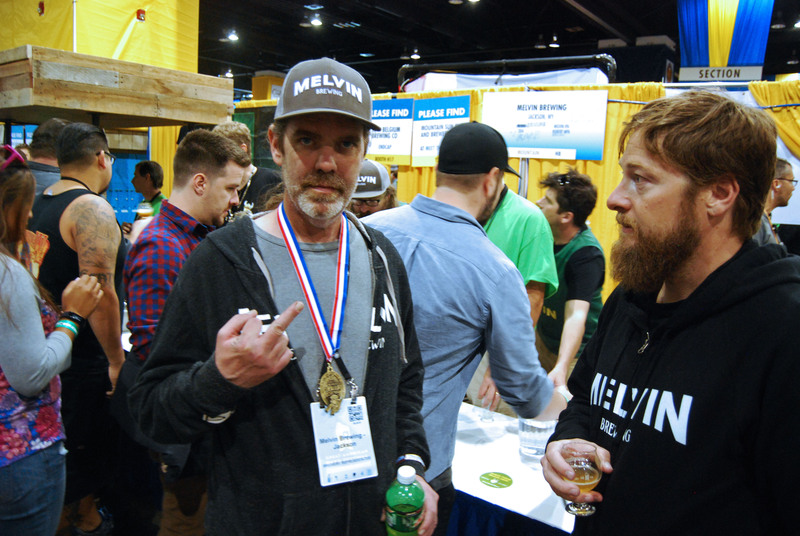 Head Brewer Kirk McHale with his GABF gold medal for Wet Hop Melvin IPA as Jeremy Tofte looks on. But this was Melvin Brewing’s weekend. 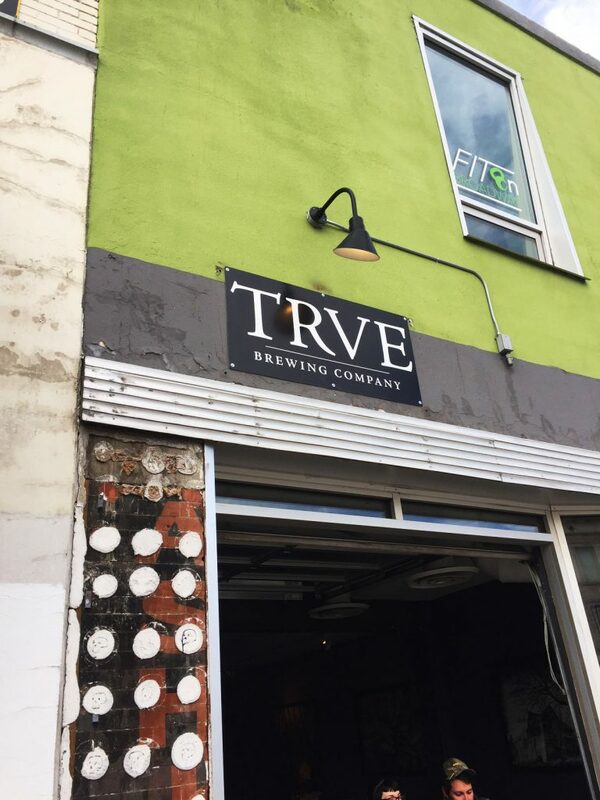 They’ve been winning medals for years (along with last year’s Small Brewpub of the Year honor), and their beer has been canned with successful rollouts in Denver (and just recently, Portland). All week long, they were almost perpetually a featured brewery at events, with their eye-catching branded bus popping up all over the city. (I made a goal to Teen Wolf on top of that bus. I did not Teen Wolf on top of that bus.) At Freshcraft, they brought last year’s gold medal-winning fruit beer Ch-Ch-Ch-Ch-Cherry Bomb, and it was glorious. It’s a beautifully muddled crimson beer that’s wonderfully cherry-forward and sweet without being cloying. Their session IPA Tiger Style was nothing to f’ with (sorry) as it has a huge citrus and pine flavor with a very crisp and light body before bringing back a sticky bitterness for the finish. At the fest, the Brosaic was a tropical fruit and sticky piney herbal session (?) IPA that finishes with a decidedly unsticky bitterness. (For the Chicago locals, think of a cleaner, crisper Lizard King from Pipeworks.) Their eponymous Melvin IPA is explosive with citrus and tropical fruits, a few sweet malts, and a bitterness that’s more approachable than most IPAs. This one I tried on Friday before it had won the silver medal for Mixed-Culture Brett Beer, and it felt great to have my appreciation justified! Go, me! I absolutely loved the grape notes on it, and the way the lightly moldy pineapple Brett notes add a funk to what would’ve otherwise been a delicate wine-like blonde ale. There’s also a spicy citrus note from the coriander that just complements this wonderful sour. 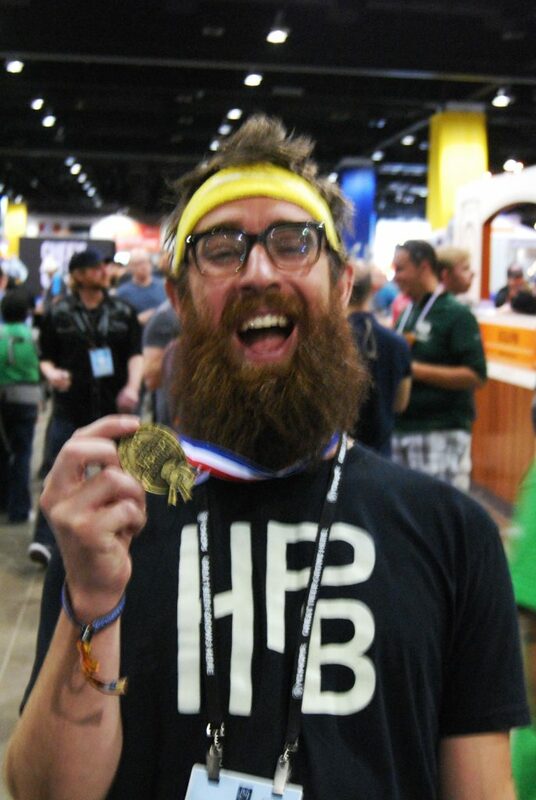 Bob Kunz of Highland Park Brewery was so excited for his GABF gold medal for Good Green that this was the best pic we could get. The gold medal winner for chocolate beer, this beer was love at first sniff – the aroma is like entering an artisan chocolate shoppe, or snorting straight up Swiss Miss. Either way, the smell hits you a full arm’s length away, and the flavor is thick and chocolatey without cloying or obnoxious sweetness. Oats provide a creaminess, and the ABV is completely hidden under the alluring dessert-like flavor of this absolutely decadent and lust-inspiring beer. We’ve had some experience with Night Shift, but most of our experience with them has been with their sour beer. Their revered hoppy beers lived up to the hype. The Santilli is one of those tropical and pine-forward IPAs – which sounds like every other IPA – that distinguished itself from others with its clean body and crackery crisp finish that made me want an ever-flowing keg. The 87 worked on a similar level of drinkability, but it was clearly more pungent on the aroma and richer in dank resinous bitterness and muddled fruit notes. We were smart enough to schedule late flights out of Denver on Sunday, so we stopped by three breweries, all a short trip south of downtown. We arrived just in time for Side B of The Number of the Beast, so yeah, this started out perfectly. They were not doing flights, but every beer was offered in a $2 or $3 sample pour, and after the first few, it became clear that we would drink their whole menu. And we did. Both their mixed fermentation and clean beers are delicious in their own right – there wasn’t even a mediocre beer in the bunch. Of our favorites, I particularly enjoyed the Burning Off Impurities, a mixed culture coffee amber ale that mixed a lightly caramel coffee flavor with the taste of goji berries and currants. Ancient Bole is a foedre saison with El Dorado hops and tastes like lemon blackberry yogurt but soft and extra drinkable. The Buried Sun had a similar mouthfeel, but it had a mix of caramel bread and lemon-juice soaked dark raspberries on the palate. The sour pale ale Cursed was like a lemonade wheat ale with a slight bitter hop crispness and a light tartness all atop a medium carbonation. Despite the black metal facade, the place felt very warm and casual, and the wailing of Bruce Dickinson in the background made every sip seem triumphant. 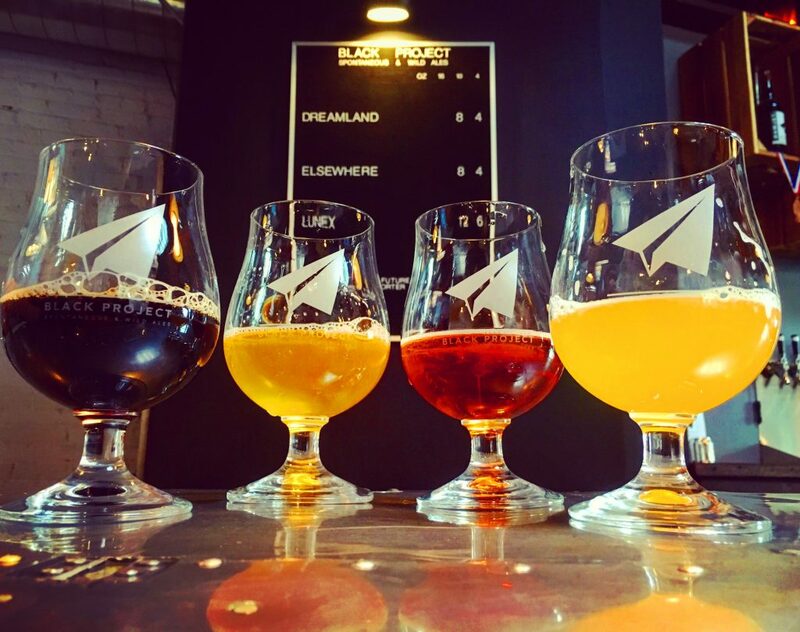 I somewhat pretentiously appreciate the contrast between Black Project’s beers being so colorful and literally wild, yet their aesthetic is stark and two-toned. They are located a 10-minute Uber ride from TRVE straight south down Broadway – a perfect one-two punch if you are low on time. The exterior is painted black and white with their stealth paper airplane logo. Inside, the bar tops are airplane wings, crates hang asymmetrically on the walls, and there’s a display of clocks set to a variety of time zones. Otherwise, the rest of the place is a little laboratory-esque, which is appropriate knowing how James Howat works. But the beer is the spicy raspberry compote drizzled over the plain cheesecake of the place itself, and you appreciate the interplay of both even more. 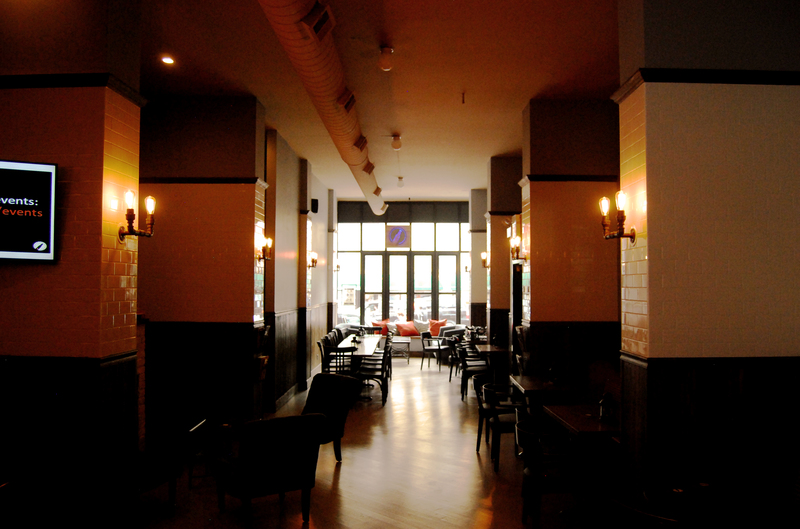 Only a few things have changed since the switch from Former Future Brewing Co., including the clock wall and a few decorative pieces here and there. But when we arrived, the beer list had been decimated by a busy weekend, with only four of ten taps still running. It ended up working out, as every beer was great, and it left us with no doubts on our choices as we each drank all four. 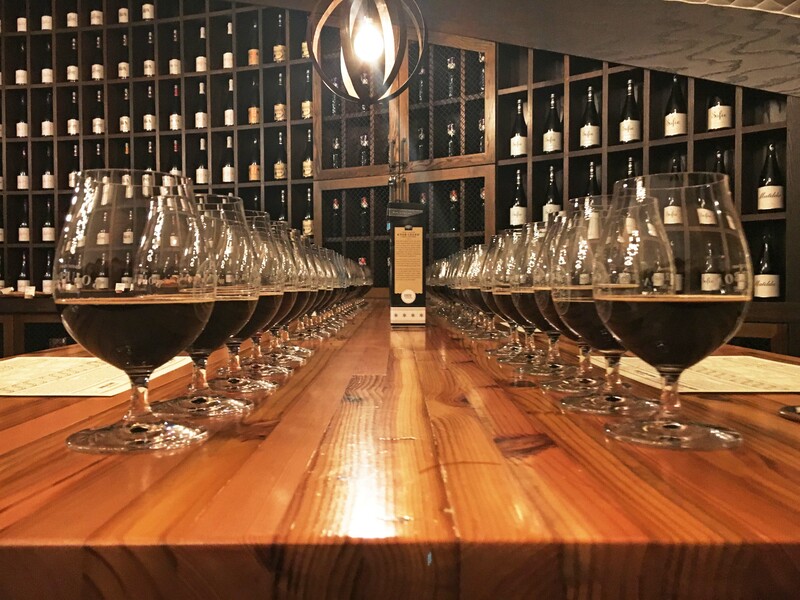 The Lunex is the GABF highlight Oxcart but with coffee added, and the bright fruity flavors of the coffee transformed this into an even more complex beer, with light roast notes sneaking past the array of stone fruits. The Elsewhere is a red sour bursting with tart cherry and cranberry flavors, with an almost lactic acidity in the middle, before it finishes remarkably dry. Dreamland pushed the acidity a bit past my brink that day, but I still appreciated the lemon zest, grains of paradise, and green grape notes it gave off. The final beer was one of the last remnants of the Former Future brews, the Salted Caramel Prim & Porter, a beer that is as advertised, tasting like a chocolate-dipped and salt-encrusted caramel, but with enough bitterness in the brew to keep the sweetness at bay. It’d be a shame if this was never made again. Even if there were only two beers on tap, this would be a worthwhile stop for any sour beer lover. So in summation, beer good, some lemony.